Montana ’s farmers and ranchers pay close attention to the weather. During the growing season, rain, or lack of it, is always on their minds. So when the national Oceanic and Atmospheric Administration (NOAA) forecasted a drought for the state this past summer, with worse conditions for northeastern Montana, Phyllis and Jim Furman, who farm spring wheat near Glasgow, weren’t exactly delighted with the news. Strangely, though, the whole northeast section of the state, in spite of NOAA’s forecast, experienced above average rainfall – unlike most of the rest of the state. And the Furmans believe they know why. With twenty other farmers and ranchers near Glasgow , they hired a rainmaker. Phyllis was no stranger to the concept of rainmaking, having read Wilhelm Reich, the controversial scientist of the 40s and 50s. Reich, a close student as a young man of Sigmund Freud, had identified what he claimed was a mysterious energy in the human body, and later professed that that energy was present everywhere, in everything. He called it orgone energy, and later discovered the ability to make rain, some say, using the same principles of orgone energy. With some knowledge of Reich’s discoveries, in 1990 the Furmans hired Matt Ryan and his colleague Jim DeMeo of the Orgone Biophysical Research Lab in Ashland , Oregon . Ryan and DeMeo traveled to Montana that year, but it was a hurried effort, Phyllis told the Pioneer. DeMeo had to leave for Paris . The two of them wouldn’t be able to complete the work. With the constraints in mind, the Furmans hired the duo anyway. And they made it rain, Phyllis says, only more of it fell further west in the dry lands of North Dakota . That first effort, however imperfect, sold the Furmans on DeMeo and Ryan. And when a high pressure dome sat over the state in 1992, and again in 1993, they called Ryan. And he responded, both times. And both times it rained. They called Ryan again in 1998, and again it rained. 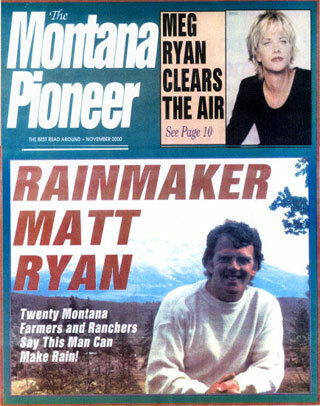 So when they heard that NOAA had forecasted a severe drought for northeastern Montana for the summer of 2000, they naturally turned to Matt Ryan once more. And naturally, Phyllis Furman told us, Ryan brought the rain. For the week ending June 10, 2000, the report states: “Precipitation around the state was generally light with the exception of areas in the northeast received 1.5 to 2 inches of rain during the week.” This, in an area that was supposed to experience more severe drought than the rest of the state. Statistics for the following week also show significantly higher rainfall in the northeast region, a trend that continued through July. And by the end of July, out of 65 reporting station in Montana , only 13 reported average to above-average precipitation – 10 of those 13 stations were in the northeast region where Ryan had done his rainmaking. Sadly, the majority of the stations throughout the state reported significantly lower precipitation than the average, levels that correspond to crop failure. Rainmaking is, of course, the stuff of legends and shamans. No one is supposed to be able to make rain, not in the world of modern materialistic science. DeMeo, an academic who tried to go mainstream with his weather work, was ultimately denied the opportunity to obtain validation from the scientific community even though he successfully proved out his master’s thesis on the subject. And Wilhelm Reich, considered very controversial by most of the scientific world, hardly lends credibility to the rainmaking craft, in the view of the scientific establishment. But Phyllis Furman, along with Ryan, liken rainmaking to other natural phenomena, lightning and dowsing. Using long metal tubes and certain water sources (natural springs, for instance), Ryan says water in the earth can attract water in the air, the same way a charge in the ground attracts a charge in the sky, causing lightning. Then there’s the dowser, or water witcher, used commonly in Montana to discover underground water for wells, and even minerals for mining operations. Water produces energy currents, Furman explained, that the dowser detects, and those energy currents can be directed. Ryan’s rainmaking method, while closely guarded, involves extremely simple technology, long pieces of metal pipe that are, as far as we can tell, inserted in water like antennae and directed in such a way, according to Ryan, that he can guide and direct streams of energy in the atmosphere that move weather patterns. This is, of course, scientifically unproven. It is, more accurately, so incredible to mechanistic scientists that it is brusquely dismissed along with Wilhelm Reich and theories about orgone energy. “He had rain medicine,” Ryan said, acquired through practiced attunement with the subtle forces of Nature. And it was knowledge of these forces that brought Ryan to a deeper understanding, and to practicing rainmaking without man-made tools. Ryan spoke of his communion with Nature as a living being, likening it to seeing faces in the clouds, then finding that those faces are looking back at him, communicating a conscious presence. To a rainmaker, rain is not simply water driven by wind; it is the precipitation of subtle energy, the same energy detected by dowsers. Conventional scientists, Ryan says, as opposed to scientists like Reich, only talk about the jet steam in terms of wind – missing the inherent energetic phenomenon. By August of 2000, Montana was in flames, along with much of the West. Raging fires had already destroyed homes and forests hear Helena and in other parts of the state. The smoke from those fires, including blazes that threatened park County, choked the sky for weeks, dropping thin coating of ash clearly visible on car windshields in Livingston and Bozeman . Matt Ryan’s way is that he does not intervene unless asked, he told us. He does not solicit, and he considers his work “healing,” not a commercial enterprise. And so he did not intervene in Montana , nor anywhere else in the West, until a call came in from a physician, a former student of his in the Helena area, where the fire had singed the hillsides surrounding Canyon Ferry Lake , causing severe damage to houses and property. In this case, Ryan did not travel to the area to bring relief. Instead, he worked with DeMeo from a remote site, influencing the Northwest’s weather patterns from his home in Mt. Shasta , California . Ryan began working August 6 and finished September 3 in a series of three operations. In the meantime, federal officials stated that they did not expect the Montana wildfires to be out until the end of October or early November, when the cooler weather and fall rains begin. That assessment was based largely on forecasts and advice from the National Weather Service, which works closely with the forest service during wildfire season. No one expected rain early. It wasn’t supposed to happen, especially in the midst of the severe drought. But the rains came to the Helena area at the end of August and in early September, contrary to the forecasts, and then spread out from there with snow following in mid September that virtually doused the last remnants of the fires.